Quite a few years ago, during my undergraduate studies, I took a course named “Science in Art”. The course explored various scientific subjects such as light and symmetry as reflected in famous paintings, sculptures and other artistic creations. For my final course paper I decided to explore both artistic and scientific aspects of photography. I did quite a bit of research for the paper and learned a lot in the process. Anyway, the paper was lying on my hard disk for years and I thought this might be a good time to share it. I posted the paper online as browseable HTML and PDF. 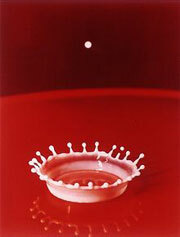 The title image for the paper and this post is “Milk Drop Coronet” by Harold Edgerton – an electrical engineer who began to take photographs as scientific experiments. That’s science and art for you! This entry was posted on Friday, June 22nd, 2007 at 9:36 pm	and is filed under Academic, Photography. You can follow any responses to this entry through the RSS 2.0 feed. Both comments and pings are currently closed. Sorry i posted this to the wrong page.